As the year draws to a close, it's time for another round of reflection and setting goals for the following year. As I look back on the year, I'm generally happy with what I accomplished but I was unable to make progress on many goals. Out of the year I had about 4 months of so where I could reasonably brew, and this was quite limiting. reflected in brewing. I spent about 1/4 of the year living and working in Germany and additionally about 1/3 of the year on couches and spare bedrooms on either side of international moves (5 out of the last 13 months if you count December 2015). So the European work seriously cut into brewing time and my overall sense of stability and feeling like I had a home. I'm very thankful for the friends that housed me (Jess & Neil, Andrea, Marcus & Dana, Jay & Tracy) and my beer (Mark, Jess & Neil) for giving me the stability that I had and the opportunity to tuck some (well, lots and lots) of beer away for aging to come back to. My generally sanity and ability to do pretty much anything beer-related in the past year is thanks in large part to these friends. On the whole the past year has made me feel at times like a "theoretical brewer" rather than a brewer. I took about 1 year off of brewing and spent much of this time looking through historic recipes. By the end of this I noticed that I was having a harder time contextualizing what specifics meant. This is coming back quickly, so it was illustrative of how easy it is to pick back up when you think about beer way too much. But it also illustrated to me how quickly I lost parts of practical brewing intuition that I had worked hard to earn. I’m happy to be getting these back and am looking forward to continued brewing within a select range of styles and process, while being mindful to not let beer take over too much as it has before. So with that preface to 2016, I’m going to look back on the year in beer for me. Brasserie Au Baron in northern France. Europe travels: Being based in Germany for work opened the door to many great travel opportunities (beer, wine, food, etc.). Most of these were focused on Belgium and Northern France and the continued ability to make repeat visits helped to continue building relationships with European brewers and beer enthusiasts, and some of the Americans that share a similar passion and travel frequently. This has by far been the highlight of the last few years of beer to me – the connections I’ve made and what I’ve learned from others about Belgian beer and Belgian culture due to making those connections. Historic Research: 2016 was a great year for the historic Belgian & French beer research I’ve been doing. Being based in Europe helped a lot for having discussions with people who really know this stuff and for tracking down resource material. Thanks to the many people who have helped with this research (especially Thierry, Niels, and Yvan). The research has led to some interviews and presentations, and it looks like there may be more on that in the coming year. Lambic.info: There is more on this below in the 2017 goals, but one of the highlights of the year in beer for me was being invited to join lambic.info toward the end of the year. This site is a great resource and a massive amount of time and work went into building the site into what it is today. I’ve so far under-performed in my contributions (based on the same schedule-related constraints that limited brewing in the few months that I was able to). But I’ve got some plans to make up for that in 2017. House Mixed Culture: I've made essentially no progress here. I’ve been brewing basically two types of beers (low-OG saison & saison-like beers and lambic-inspired mixed-fermentation beers) and I am keeping the microbes for those two categories mutually exclusive for now. But I’ve been happy with my results on either end, and I could start working toward a mixed culture that I’ll use for saison-oriented beers. For now I think I’ve found the base yeast for building that culture. If I continue to work on the culture, it will have to be something I could package fairly young and be happy with to allow for the quicker turnaround beers I’ve been brewing without overcarbing too much in the bottle, which may be a concern with the work I’ve been doing (in mashing and yeast strain) to raise my FGs. So we’ll see how this goes. Spontaneous beer: Progress has been minimal here, and this is something I’d like to try to prioritize going forward. I did include a spontaneous component in some --recent blending--, but so far no fully spontaneous blends and it is unlikely that there will be any soon. So I guess I need to get some more base beers in and keep practicing my blending in general. This is definitely not the sort of thing that I will make regular steady progress at and it is more likely going to come in major steps when I have beers that work out well and are aged enough to use in blends. Hops: The past year has brought me even further from new and non-European hops. At this point I am firmly rooted in landrace hops form continental Europe and the UK. Every so often I'll venture out of this for newer European hops of more noble-oriented US hops (something like Sterling, Willamette, etc.). But my taste preferences have been further solidified by my extended time in Europe. This is unlikely to change and I’m happy to focus on noble-type hops. But I would like to find hops that are grown closer to me that I like as much as the classic European varieties, especially given my focus on using local malt. Hoppy Belgian-inspired beers: My trend toward hoppier Belgian-inspired beers has continued through 2016. I've had multiple friends comment on this when I give them my homebrews, and I think my use of European hops is improving. I’d like to continue brewing in this direction with inspiration from breweries like Thiriez, De La Senne, De Ranke and Seizoensbrouwerij Vandewalle. 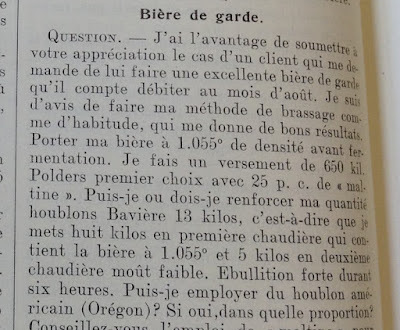 Historic research: I plan to prioritize the historic beer research again this year. Hopefully I’ll be able to make progress organizing thoughts for other beers like lambic, bière de garde and saison. I’m planning to return to Europe in the coming year, at least for leisure and possibly for another temporary move, so I plan to take advantage of that opportunity to work on more sources. There are some talks already scheduled for the coming year and hopefully I can work in some more as well. Lambic.info: In the latter half of 2016 I was invited to join lambic.info. This is an amazing resource and I’m really excited to be involved. But unfortunately between finishing my thesis and multiple trans-ocean work trips, I haven’t been able to contribute much yet. I hope to change this in first few months of next year. Blending and spontaneous beers: I’ve got a lot of aging beer sitting around that I need to be putting to use. Just before heading off for a research cruise in December and January I made about 80 liters of blends of mixed-culture beer that was between 47 and 15 months old (see this post and this post from the facebook page), but there are a lot of aging carboys left to use. So hopefully in the coming year I can continue learning about blending and tasting my blends to see what worked better or worse as they age. The first big blending I did in spring 2015 has already helped me out there, but of course there is more to be done. Part of this will include continuing to brew spontaneous beers to hopefully create a fully spontaneous product in the next year or two. We’ll see about that. Hopefully you all have some good goals for the New Year as well!